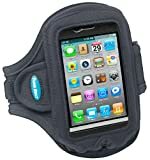 This armband is designed with a pocket that is large enough to hold the Otterbox iPhone 4 / 4S Defender Series case. It also fits Otterbox iPhone 3G / 3GS Defender Series case, Otterbox iPhone 4 Commuter Series case, Otterbox iPhone 3 / 3GS Commuter Series case, and Otterbox Impact Series cases for iPhone 4 and iPhone 3G / 3GS. If you would rather carry your iPhone or smartphone around your waist, then try this lightweight and comfortable carrier. This slim profile belt fits all iPhones, iPod touch and many smartphones including any of those that fit into Tune Belt's armbands #AB82 and #AB83 (partial list below). It is packed with features that provide unmatched comfort, convenience and protection while you run, workout or listen on the go.